What key estate planning documents should a doctor have prepared in advance of retirement? A will is a living, breathing document that should be revisited at least once every five years and changed to reflect your current marital status, life scenarios and objectives. For example, perhaps philanthropy was not important to you during your professional career but now has taken on new meaning post-retirement or towards the end of your career. Parents may want to provide for a disabled grandchild who was born subsequent to the drafting their original will. Or there could be a change in tax legislation, so that what was once considered prudent tax planning is no longer tax-efficient. For instance, although it is still considered good tax planning to set up a trust in a will for the deceased’s spouse and each child, due to new rules, testamentary trusts and estates only receive favourable tax treatment during the first 36 months of the trust. After 36 months, multiple testamentary trusts no longer have access to graduated tax rates. For similar reasons, Powers of Attorney for personal care and property should be put into place and/or reviewed. Perhaps a child has demonstrated poor financial aptitude or has had to declare bankruptcy recently. Do you really want that child to have the authority to make financial decisions on your behalf, with your money? Also, depending on the wording used in some Powers of Attorney, they can become stale-dated or invalid after a period of time when dealing with specific property. 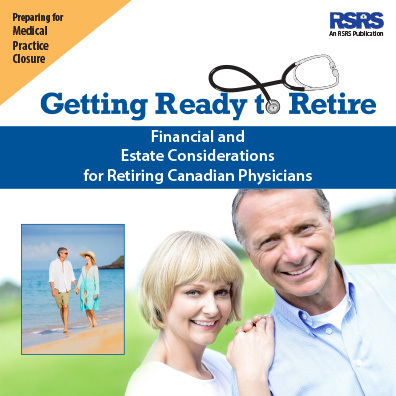 This information is excerpted from “Getting Ready to Retire: Financial and Estate Considerations for Retiring Canadian Physicians.” A physician contemplating retirement has a myriad of details to tend to, both professionally and personally. Prudent financial, estate and legal planning can make a big difference, both in the short and long terms. If you’d like a printed version of this useful book mailed to you, call RSRS at 1-888-563-3732, Ext. 222 or get the free download now from http://www.recordsolutions.ca/guide. There is no cost associated with obtaining this information.